Party-goers, unite! 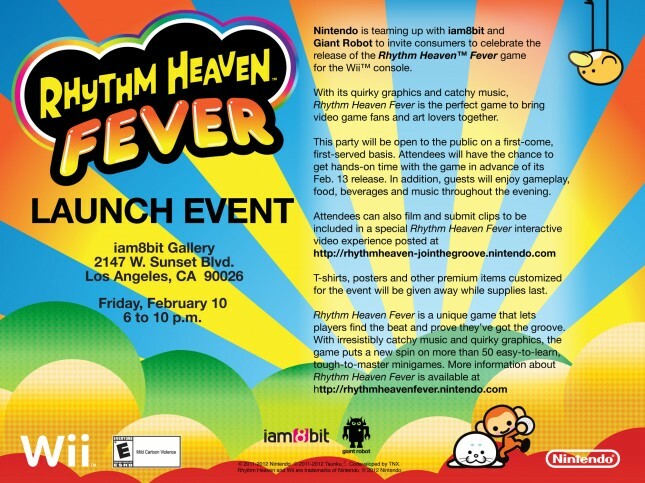 Nintendo has teamed up with Los Angeles-based production company iam8bit and Giant Robot to promote Nintendo’s upcoming groovalicious gameÂ Rhythm Heaven Fever (Wii). While the game itself looks rather interesting, we’re more intrigued with the fact that Nintendo will host a party at the iam8bit gallery in Los AngelesÂ nextÂ Friday, February 10th from 6-10 p.m. Multiple highlights of the party include hands-on time with the game before the scheduled February 13th release, refreshments and music throughout the evening, and the chanceÂ to film and submit clips to be included in a specialÂ Rhythm Heaven FeverÂ interactive video experience. While the event is public, Nintendo has specifically announced that it will be on a first-come, first-served basis. The iam8bit Gallery is located at 2147 W. Sunset Blvd, Los Angeles, California. See you there!